Red Star Poker is one of the biggest and best Russian-focused online poker rooms. 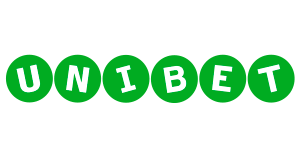 It was founded in 2005 as an independent poker site and then joined Microgaming (MPN), the biggest online poker network in the world in 2013. Red Star Poker has maintained a very good reputation within the poker industry in the last 12 years. It uses the state-of-the-art MPN software, which has won poker software of the year at the EGR B2B Awards for the fourth year in a row! Red Star Poker stands out from other sites on the network by offering the upcoming digital currency bitcoin as payment option. The site boosts great traffic around the clock and together with fantastic promotions and our amazing rakeback deal, which offers you 30% rakeback fixed Red Star is a great choice for both recreational as well as professional poker players. Our team consisting of online poker experts and professional poker players alike has been testing intensively all important features and Red Star Poker easily passed the test. The conclusion, in the end, was that we highly recommend Red Star Poker for every kind of online poker player. 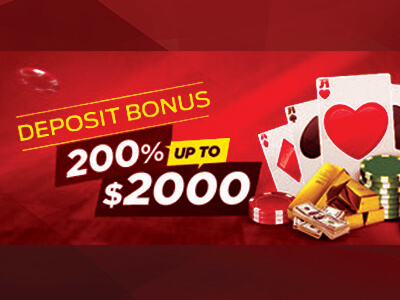 Red Star Poker offers one of the most generous first deposit bonuses of up to a massive €2,000! On top of that you receive 30% rakeback fixed, when signing up through us. Red Star Poker support and live chat are very helpful and there to solve your problems 24/7. Please feel free to CONTACT OUR SUPPORT in case you have any questions or look for a custom deal and don’t forget to leave a comment to let us know how your experience was when playing at Red Star Poker! 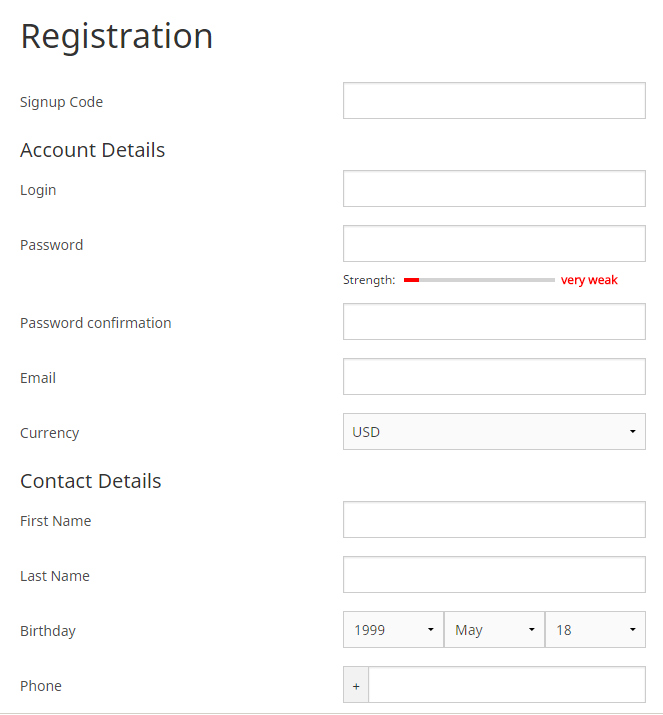 How to open an Account at Red Star Poker? Opening an account at Red Star Poker is a walk in the park. Simply follow our step-by-step registration guide and your poker account together with A MASSIVE FIRST DEPOSIT BONUS OF 100% UP TO €2,000 will be ready to play in no time! As soon as you have registered at Red Star Poker, you can make a deposit to claim your first deposit bonus of 200% UP TO €2,000. 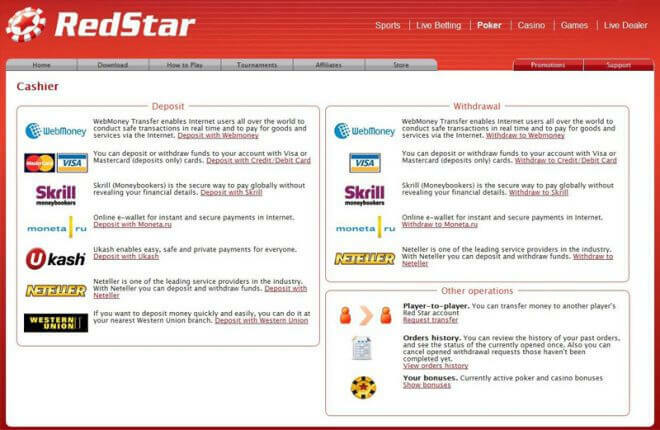 Click on the “Cashier” button within the Red Star poker client and choose your preferred deposit option. That’s all! Now your account is set up and you are ready to play your favorite online poker games at Red Star Poker. Here, simply enter your Username and be sure to pick the right Skin form the drop down menu. You can find the name of the Skin by clicking the “Claim Now” button on this page. Red Star Poker offers some of the best promotions in the poker industry. On top of a massive first deposit bonus, you can benefit from special bonuses and huge private promotions, when signing up through VIP-Grinders.com. And let’s not forget our fantastic rakeback deal, which gives you a VIP boost and directly the maximum rakeback percentage possible with 30% fixed, while players who don’t sign up through us only receive between 0 and 30% rakeback! 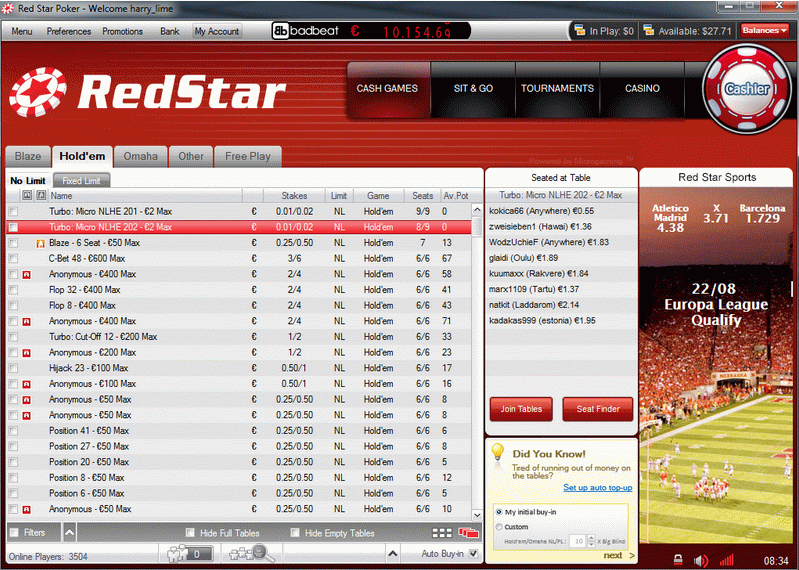 The rakeback is paid out monthly directly to your Red Star Poker account. Red Star Poker offers one of the most generous Sign Up Bonuses in the industry with 200% UP TO €2,000! Simply enter the bonus code “VIPGRINDERS” in the first column during registration. Your FIRST DEPOSIT BONUS which is worth approximately 20% and expires in 30 days. While the standard rakeback offer at Red Star Poker is between 0% up to a maximum of 30% rakeback, you will get the maximum 30% rakeback fixed plus a VIP level boost straight away, when signing up though us. Become a Poker Pro when getting sponsored for live poker tournaments of your own choice. You are an ambitious poker player and looking for a sponsorship deal? You have come to the right place! We can provide live sponsorships for big live tournaments like the WSOP, WPT or EPT for our players. And the best thing is: The sponsorship packages can be used for tournaments of your own choice. CHECK OUT MORE INFORMATION AND HOW TO APPLY HERE. Red Star is part of the biggest online poker network in the world and therefore enjoys huge traffic at every day and night time. In addition to that, Red Star offers a huge variety of games such as Texas Hold’em, Omaha, Omaha Hi/Lo, 5 Card Stud, 7 Card Stud, Razz and 5 Card Draw plus their own fast-fold poker client called Blaze Poker plus more than 4 million euro in tournament guarantees every month! The award-winning software is one of the most stable and customer friendly in the business and the rake structure at Red Star Poker is extremely favorable as well making it a great site for grinders and professionals. CHECK A DETAILED REVIEW ON RED STAR POKER´S TRAFFIC, SOFTWARE AND AVAILABLE GAMES HERE. One of the best things is that you can play online poker at Red Star Play at Red Star wherever you are, no app installation required. 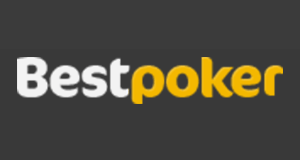 The mobile poker client is available for all mobile devices which means playing poker on the go was never easier. Simply DOWNLOAD THE REDSTAR POKER MOBILE APP and enjoy playing online poker on your iPhone, iPad and Android, whenever, wherever. Red Star offers a great variety of cash games and tournaments also on their mobile poker client. You can play cash games or the fast and furious Blaze poker at various limits anytime and anywhere! As mentioned above the Red Star Poker Mobile App is available for all operating systems and mobile devices such as iOs, Android, Windows, Mac and even Linux. To download the Android version of the App however, please go to the WEBSITE OF RED STAR POKER. The best thing is that there is no need to download an app, when you want to play online poker at Red Star on you mobile device. Simply go to the site, login and start playing! Red Star Poker offers all reliable deposit and withdrawal options and cashouts are processed quickly. Ewallets such as Skrill, Neteller, ecoPayz are available as well as VISA and Mastercard credit cards, several bank transfers options as well as the digital currency Bitcoin are all available! Simply choose your preferred one. Great news: Red Star Poker does not charge any fees for withdrawals! Red Star offers a huge variety of all common deposit and withdrawal options including ewallets such as Skrill and NETELLER, Visa, Mastercard, Paysafe as well as several banking transfer options. What makes is special and standing out from the other online poker rooms at the Microgaming network is that Red Star Poker is also accepting the digital currency Bitcoin for deposits and withdrawals! The Bitcoin currency has risen a lot recently and reached a new all-time-high making it a very interesting option to use for online poker! Red Star Poker has earned itself a very good reputation when it comes to security and cashouts. Red Star is investing a lot of money into their support and fraud department and does everything to protect the players and their funds. All deposits and withdrawals are processed quickly and the support is available 24/7 making Red Star Poker one of the safest sites to play online poker. Red Star Poker is eligible in the following countries: Afghanistan, Åland Islands, Albania, Algeria, American Samoa, Andorra, Angola, Anguilla, Antarctica, Antigua And Barbuda, Argentina, Armenia, Aruba, Ascension, Austria, Azerbaijan, Bahamas, Bahrain, Bangladesh, Barbados, Belarus, Belgium, Belize, Benin, Bermuda, Bhutan, Bolivia, Bosnia And Herzegovina, Botswana, Bouvet Island, Brazil, British Indian Ocean Territory, Brunei Darussalam, Bulgaria, Burkina Faso, Burundi, Cambodia, Cameroon, Canada, Canary Islands, Cape Verde, Cayman Islands, Central African Republic, Chad, Chile, China, Christmas Island, Cocos (keeling) Islands, Colombia, Comoros, Congo, Congo, Cook Islands, Costa Rica, CÃƒâ€te D’ivoire, Croatia, Cuba, Czech Republic, Denmark, Diego Garcia, Djibouti, Dominica, Dominican Republic, Ecuador, Egypt, El Salvador, Equatorial Guinea, Eritrea, Estonia, Ethiopia, European Union, Falkland, Islands, Faroe Islands, Fiji, Finland, French Guiana, French Polynesia, French Southern Territories, Gabon, Gambia, Georgia, Germany, Ghana, Gibraltar, Greece, Greenland, Grenada, Guadeloupe, Guam, Guatemala, Guernsey, Guinea, Guinea-bissau, Guyana, Haiti, Heard Island And Mcdonald Islands, Holy See (vatican City State), Honduras, Hong Kong, Hungary, Iceland, India, Indonesia, Iran, Iraq, Ireland, Isle Of Man, Israel, Italy, Jamaica, Japan, Jersey, Jordan, Kazakhstan, Kenya, Kiribati, Korea [KP], Korea [KR], Kosovo, Kuwait, Kyrgyzstan, Lao, Latvia, Lebanon, Lesotho, Liberia, Libyan Arab Jamahiriya, Liechtenstein, Lithuania, Luxembourg, Macao, Macedonia, Madagascar, Malawi, Malaysia, Maldives, Mali, Malta, Marshall, Islands, Martinique, Mauritania, Mauritius, Mayotte, Mexico, Micronesia, Moldova, Monaco, Mongolia, Montenegro, Montserrat, Morocco, Mozambique, Myanmar, Namibia, Nauru, Nepal, Netherlands Antilles, New Caledonia, New Zealand, Nicaragua, Niger, Nigeria, Niue, Norfolk Island, Northern Mariana Islands, Norway, Oman, Pakistan, Palau, Palestinian Territory, Occupied, Panama, Papua New Guinea, Paraguay, Peru, Philippines, Pitcairn, Poland, Portugal, Puerto Rico, Qatar, RÃƒâ€°union, Romania, Russian Federation, Rwanda, Saint Helena, Saint Kitts And Nevis, Saint Lucia, Saint Pierre And Miquelon, Saint Vincent And The Grenadines, Samoa, San Marino, Sao Tome And Principe, Saudi Arabia, SaudiÃ¢â‚¬â€œIraqi neutral zone, Senegal, Serbia, Seychelles, Sierra Leone, Singapore, Slovakia, Slovenia, Solomon Islands, Somalia, South Africa, South Georgia And The South Sandwich Islands, Soviet Union, Spain, Sri Lanka, Sudan, Suriname, Svalbard And Jan Mayen, Swaziland, Sweden, Switzerland, Syrian Arab Republic, Taiwan, Tajikistan, Tanzania, Thailand, Timor-leste, Togo, Tokelau, Tonga, Trinidad And Tobago, Tristan da Cunha, Tunisia, Turkey, Turkmenistan, Turks And Caicos Islands, Tuvalu, Uganda, Ukraine, United Arab Emirates, Uruguay, Uzbekistan, Vanuatu, Venezuela, Viet Nam, Virgin Islands, British, Wallis And Futuna, Western Sahara, Yemen, Zambia, Zimbabwe. 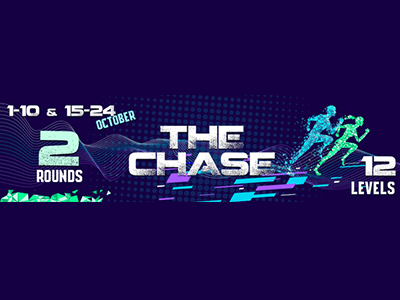 Qualify now for the €110,000 Big Bang II at Microgaming! 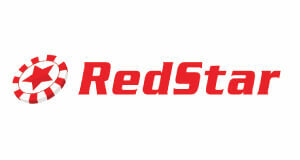 Red Star Poker is a reputable online poker brand that is primarily focused on the Eastern European markets. 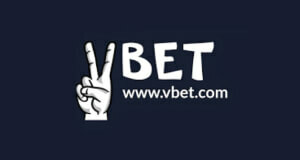 It was founded in 2005 by RSP Entertainments N.V. and soon became the flag ship site of the Cake Poker Network. After the Cake Poker Network experienced some payment processing issues, Red Star Poker migrated to a more secure network – MPN. Red Star Poker is a part of the Microgaming Poker Network or MPN for short. 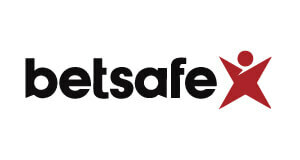 The network itself has now been in the online gaming market for more than a decade. The highest point of their journey was around the year 2005 when they dominated the European market. MPN’s lighting fast growth was put to a stop just a few years later. The main reason for that was the bankruptcy of a large part of MPN skins. 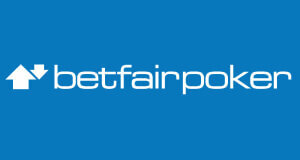 After that, MPN took some brave steps in rebranding and reinventing the online poker service. The ground breaking innovations presented by the network ware intended to create a healthy balance between the regular players that ware flooding most of the online poker and recreational players. They were successful in their efforts and formed a poker ecosystem that takes care of all members of the online poker community. 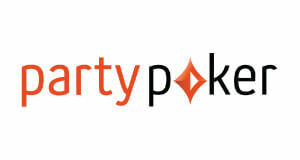 MPN has now one of the most diverse and healthy player pools with thousands of active players. 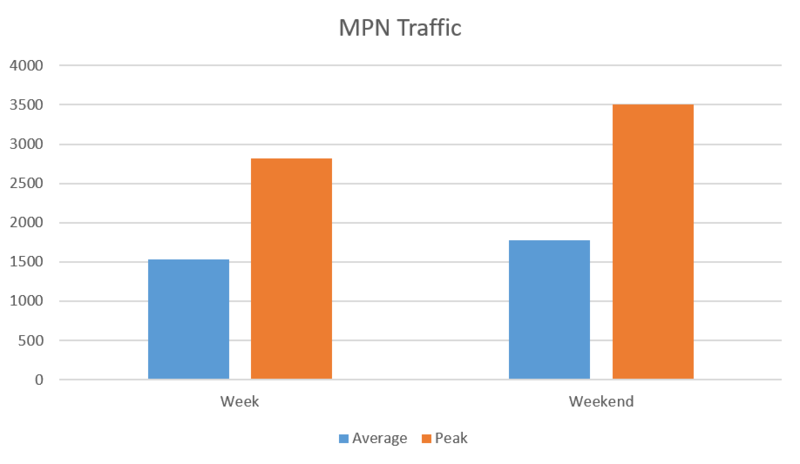 As you can see above, the MPN traffic is decent throughout the week and it almost doubles during the weekend. Due to the fact that most of the MPN’s skins focus on the European markets, the action peaks in the evening in the European timezones. Red Star Poker accepts payments in EUR, SEK, NOK, USD, GBP and CAD but additional options are added regularly. The games usually run in EUR but don’t worry, the currency exchange is made automatically when you buy-in at any game. Red Star Poker offers one of the widest game selection on the market. In addition to Hold’em and Omaha games, you can also play 7 Card Stud, 5 Card Stud as well as 5 Card Draw and even Razz. 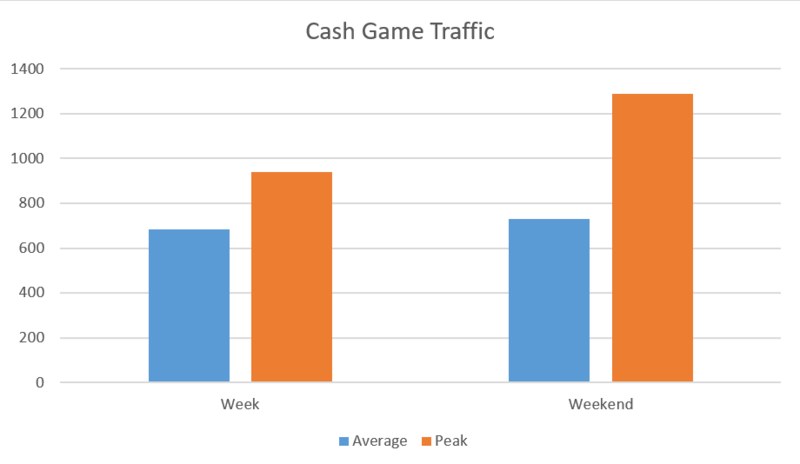 Cash game traffic is good and stable at most times but it obviously peaks on the weekends when up to 1300 players are active at the cash game tables. Stake offered on Red Star Poker range from NL2 all the way up to NL10000 but there is not much regular action above the NL2000 level. Red Star Poker also offers special anonymous tables where the player nick names stay hidden. That means that players can use HUD’s at those tables which makes the games there even softer. 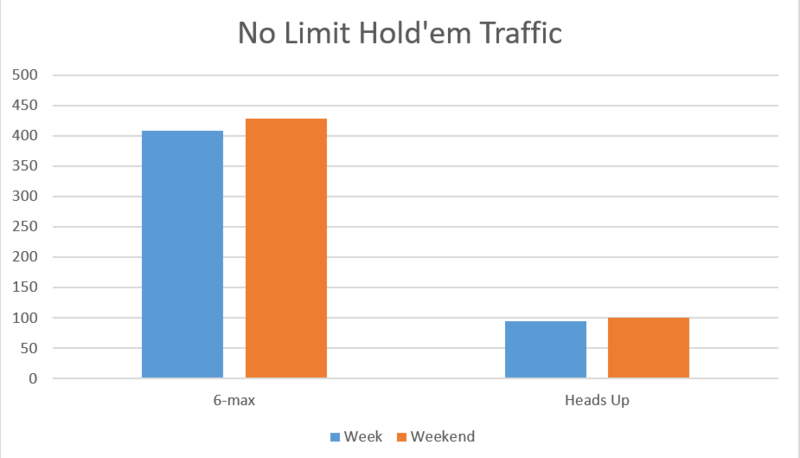 No Limit Hold’em is the most popular poker game in the world currently so it is no surprise that the NLHE tables get the most of the traffic at Red Star Poker as well. The largest share of NLHE players at Red Star Poker plays at 6-max tables, but as you can see in the graph above, there is also some action at the HU tables. Pot Limit Omaha tables also get a decent amount of traffic with games regularly running all the way up to PLO600 but offered stakes range all the way from PLO2 to PLO10000. If you play PLO you will enjoy your time playing on any of Red Star Poker. Their PLO traffic can compete with most of the world’s biggest poker networks. Even the Heads Up PLO games regularly run all the way up to PLO400. 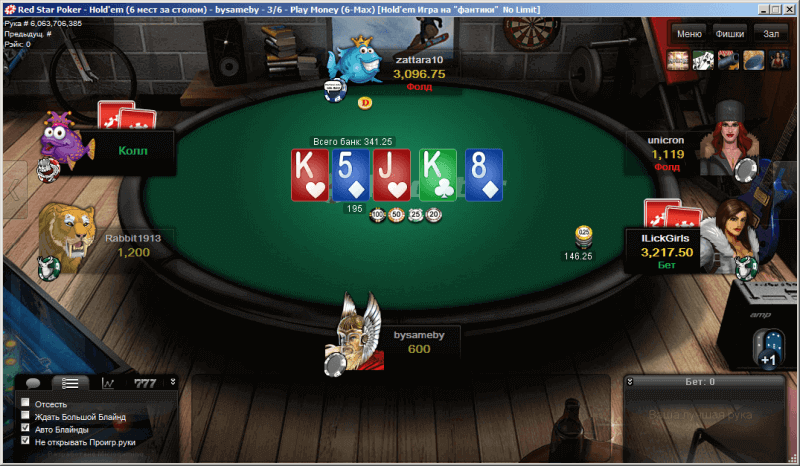 The fast-fold variant of poker on Red Star Poker is known as Blaze Poker. If you are not familiar with fast-fold poker, in fast-fold poker variants you don’t play with a specific set of other players like you would at a regular table. Instead you compete with a large pool of players at yours take and every time a hand is finished you get dealt a new hand on a new table with new opponents. Red Star Poker’s tournament schedule offers some great tournaments with attractive guarantees. You can choose from multiple low to medium buy-in tournaments but there might be some less action for those looking for high stakes MTT action. 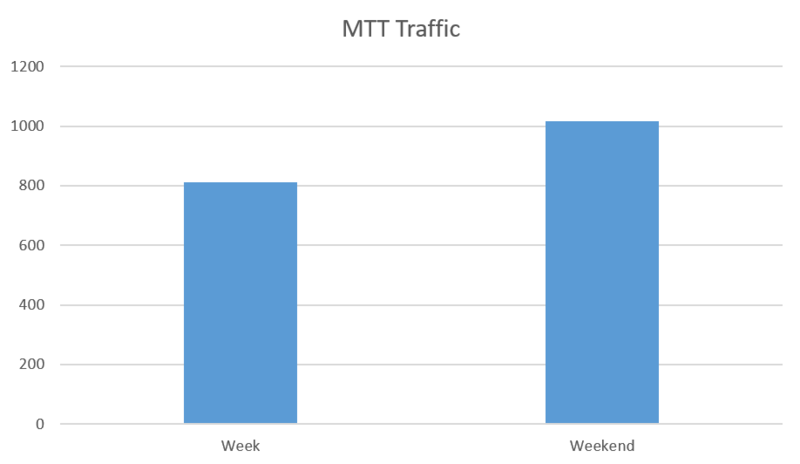 MTT traffic averages around 813 active players during the week and increases on the weekends with an average of 1000 players, when the games soften up even more due to a large influx of recreational players. The daily schedule features a handful of really good tournaments that offer great guarantees. The biggest daily tournaments are the €7,500 GTD Daily Mosh Pit and the €1,500 GTD Avalon that is also the networks biggest buy-in daily tournament. In addition to daily tournaments Red Star Poker’s weekend MTT schedule offers some exciting majors. The €25,000 GTD Sunday Showdown and €12,000 GTD Sunday Drive take the center stage over the weekend. Every now and then, Red Star Poker runs special tournaments or tournament series that offer huge guaranteed prize pools and loads of soft tournament action. You will even find freeroll series that offer thousands of dollars in added prize pools. Red Star Poker offers a good selection of Sit and Go tournaments with various buy-ins ranging from €0,01 to €1050 and formats like Double or Nothing and Fish Party SNG’s. 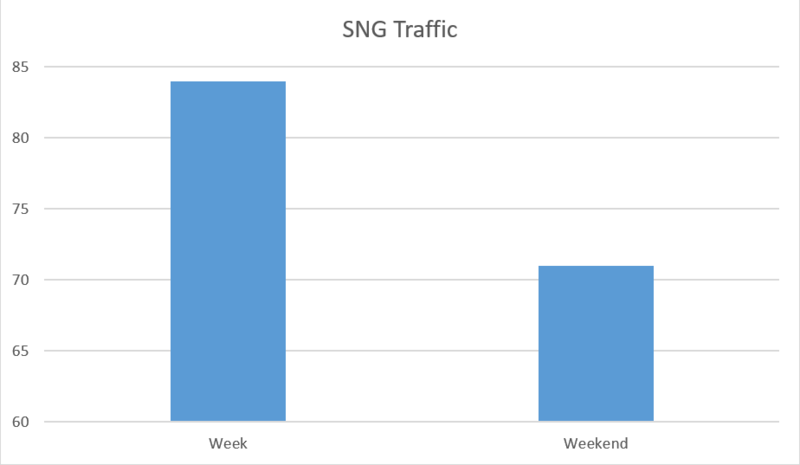 No Limit Hold’em SNG get the biggest share of traffic but there are Razz and Omaha Sit and Go’s that also run on occasion. Headsup SNGs run at all available stake levels and formats from standard to super turbo speeds. They also offer a revolutionary new HU SNG format named 10 minute HU, which as the name suggests last only ten minutes. After the time runs out both players go all in every hand until one of them has all the chips. 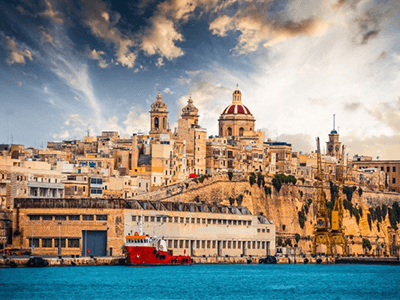 Hyper turbo or Super Turbo SNGs as they are called on MPN run at multiple stake levels with buy-ins ranging all the way up to €530. 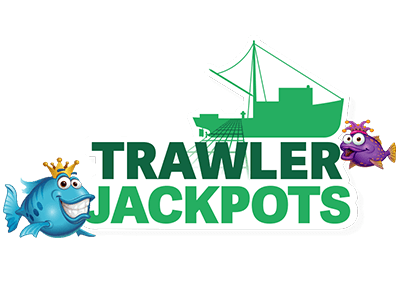 The lottery variant of SNGs that run on MPN are called Fish Party tournaments. 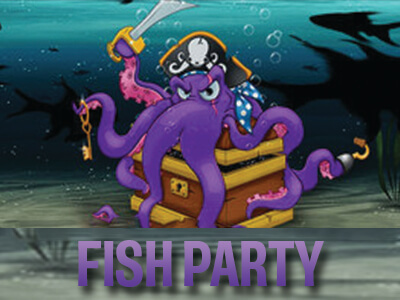 Those 3-handed tournaments run at five different buy-in levels and allow you to win up to 5000x your buy-in or even the jackpot prize that gets higher with every Fish Party SNG played. Red Star Poker offers a really amazing freeroll schedule with daily freerolls giving away hundreds of euros in cash prizes. Sometimes they even take it a step further and run whole freeroll series that boast prize pools worth thousands of euros. New players get to play two New Player Freerolls offering a €1000 and a €500 prize pool. You can find both in the “Freerolls” section under the “Tournaments” tab. The MPN software that is used by all MPN sites, is up to par with any online poker software out there. It may not be so modernly designed as some other interfaces are, but it still offers all the necessary features any poker player might need. It is available for Windows, Mac and Linux as well as for Android and iOS. You can play cash games or Blaze poker at various stake levels anytime and anywhere! The client looks great and can be visually customized to your preferences. A wide variety of customization options are available in the Red Star Poker client. Customizable Hotkeys, alerts and shortcuts make grinding easy. The tile feature allows for simple table tiling. Additional features like a four-colored deck and three different table looks will help you stay focused on the game during the long hours of grinding. The Red Star Poker lobby is easy to navigate and it allows you to find and join your favorite games in no time. It is divided into four separate sections: Cash Games, Sit & Go, Tournaments and Casino. You can than filter the mentioned categories even further using the built in “Filters” feature. You can play up to 6 Cash Game tables at any given moment. You can play up to 6 MTT or SNG table at any given moment. Hold’em Manager and Pokertracker natively support MPN, meaning your database and HUD software will work with minimal customization. Make sure that your Hand Histories are saving in English otherwise you tracking software might have trouble reading them. To locate your Red Star Poker Hand Histories go to its install folder that is by default saved in C:MicrogamingPokerRed Star Poker. Look for a GameHistory.Dat because that is where your Hand History will be saved. The rake structure at MPN is extremely affordable. HU rake caps are no more than 1 big blind and the microstakes rake caps scale all the way down to NL2, meaning the rake structure is much more microstakes-friendly than elsewhere on the internet. You can find all the information regarding Red Star Poker’s Rake structure in the tables bellow. In case you have any questions about how the calculations work, do not hesitate to contact our expert team that will gladly help you out! Tournament fees on MPN are between 0% and 10%. They depend on the buy-in of the tournament. In addition to a generous 200% up to €2,000 first deposit bonus, our Red Star Poker Rakeback deal offers players an average return of 30% rakeback. Red Star Poker focuses entirely on the game of poker and players that enjoy it. They do not push their casino and betting offers inside their poker client which is great for players that are not interested in those. Overall, it is a great online poker site offering all of the best features of the Microgaming Network. It is available almost all over the world which enables player form countries where other MPN sites are blocked to still enjoy the best the network has to offer. Have greek friends playing on this skin. Do they run good promos, pls contact me on private, thanks! Im happy to have Redstars as an option, seen not many rooms on MPN accept Greek players! Sign-up with Red Star Poker below. Use Bonus Code “VIPGRINDERS” during registration. Submit your Red Star Poker Nickname(alias) here.